High-density polyethylene construction with exclusive microban antimicrobial protection, inhibits the growth of odor causing bacteria. 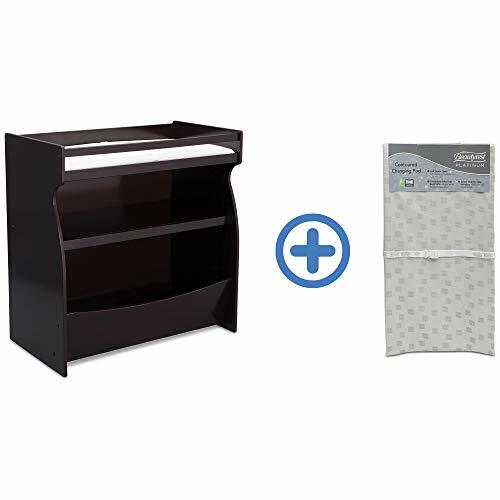 Bed features smooth, concave changing area with nylon safety straps and two hooks for bags or purses. Universal instruction graphics and safety messages in six languages and Braille. Built-in liner dispenser. 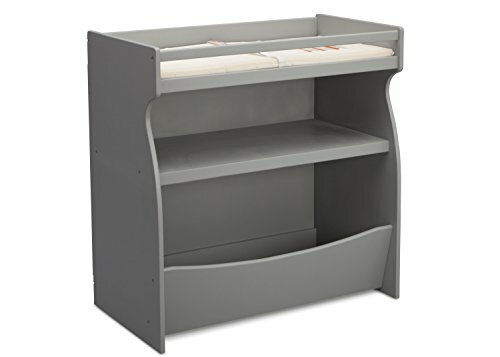 Includes steel mounting brackets and hinges. Hidden pneumatic gas spring mechanism provides controlled, one-handed opening and closing of changing bed. Constructed from 47 percent recycled material. Meets or exceeds ASTM safety requirements. ADA Compliant when properly installed. Three-ply, biodegradable. Manufactured with 50 percent recycled material. 13 x 18 size. 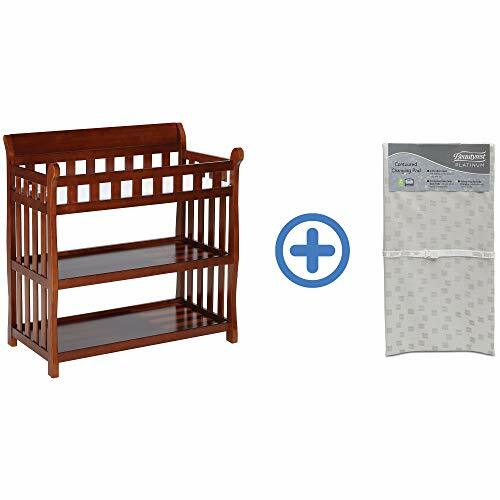 Simplify changing time with this Changing Kit! 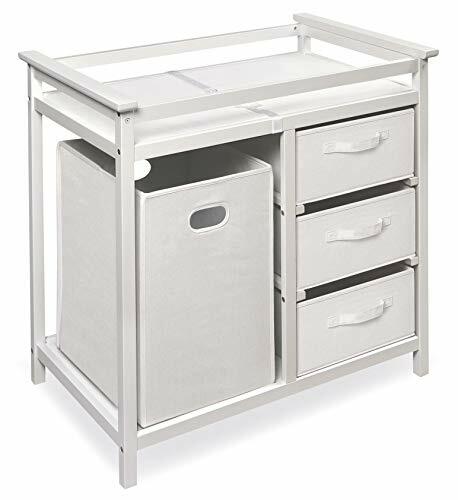 Easily transforming your dresser into a convenient changing table, it makes diaper duty doable with its secure and sturdy design. 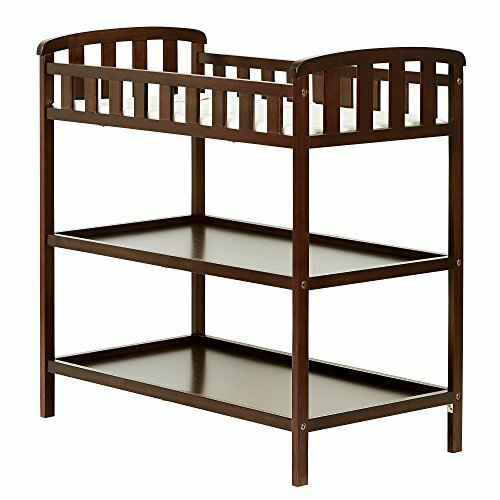 Best of all, when your child outgrows it, just remove it to reclaim the space on top of the dresser. 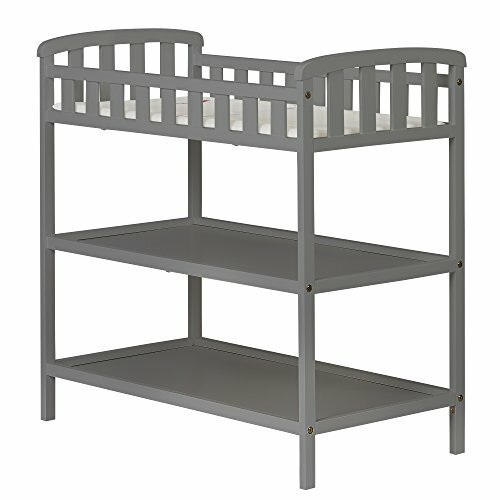 Capitalize on the corner space in Baby's nursery! 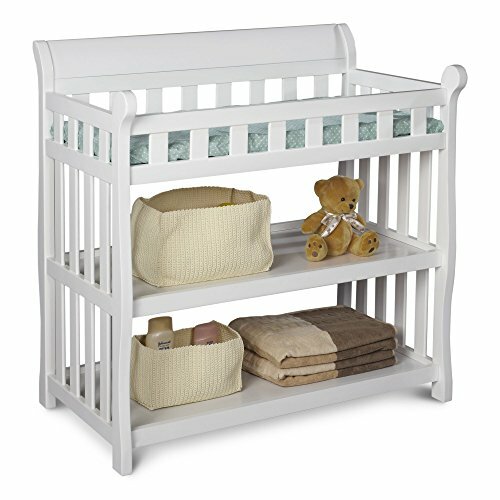 Badger Basket's Diaper Corner allows you to change your infant with feet pointing towards you. 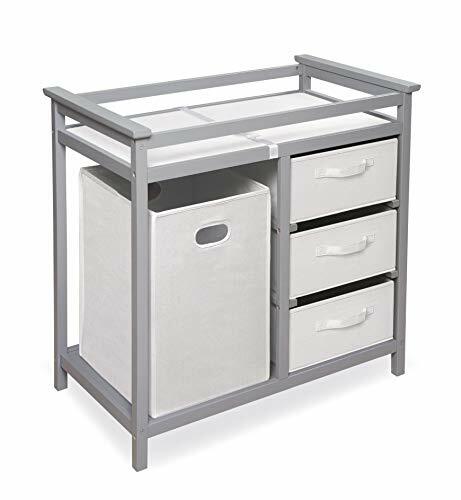 Includes a hamper and storage basket/drawer! 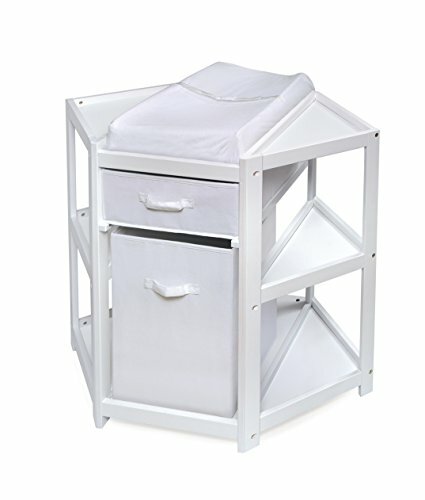 Hamper can be removed for carrying laundry to the laundry room, or to use the hamper anywhere else in the house. 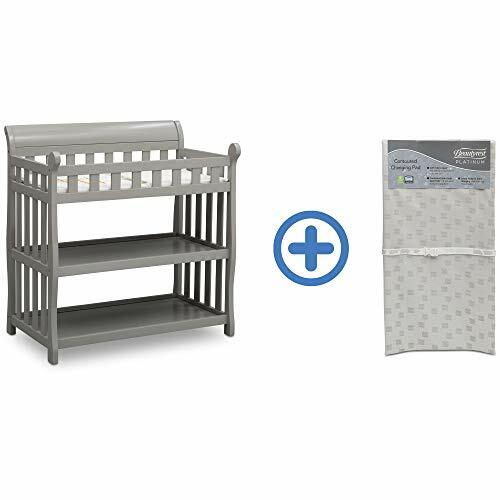 If you aren't using the hamper, your diaper pail will fit conveniently into that spot, too! 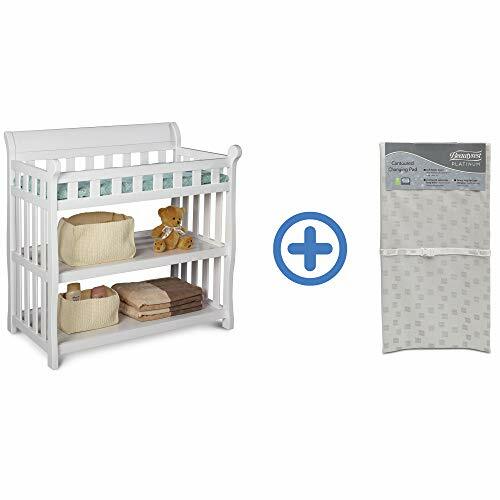 Hamper measures 13.5 inches W x 13.5 inches D x 21.5 inches H. Pull-out basket is a convenient drawer for storing diapering supplies, baby blankets, etc. 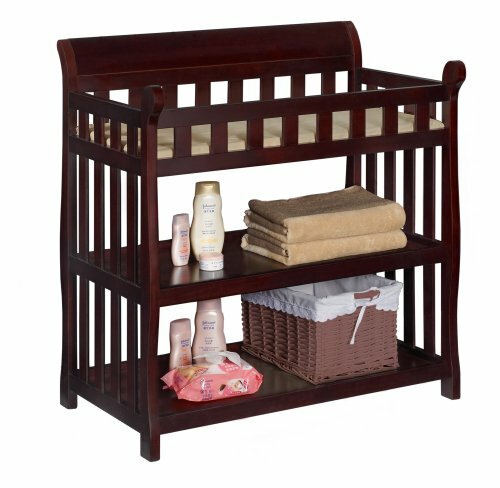 Basket measures 16 inches W x 17.75 inches D x 6 inches H. The table also features shelf storage space on either side of the changing area and on both sides below! 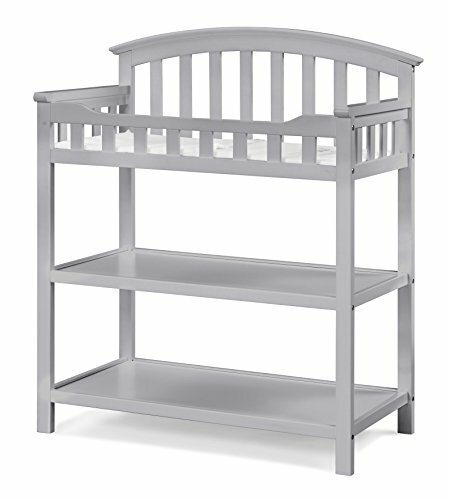 Measures about 33.5 inches high to the top of the contoured, 16 inches x 31 inches x 3 inch changing pad. Measures 31 inches from the back corner to the front edge; 40.25 inches across the widest measurement from corner to corner. The left and right sides that sit against the wall measure 28 inches from back corner to front. The angled side panels in front measure 16.5 inches wide; and the straight edge across the front measures 16 inches. 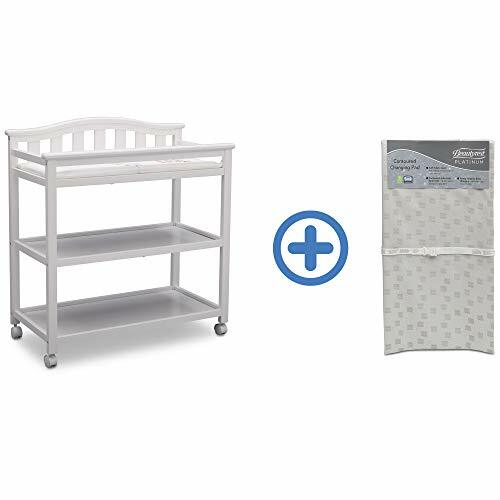 Also includes a safety belt and one white, terry cloth changing pad cover. Wipe the table clean with a damp cloth and mild soap. Table is made with wood, multi-layer wood and wood composites, and veneers. All paints and finishes are non-toxic. Fabric pad cover is 80% polyester/20% cotton. Assembly required; illustrated instructions included. 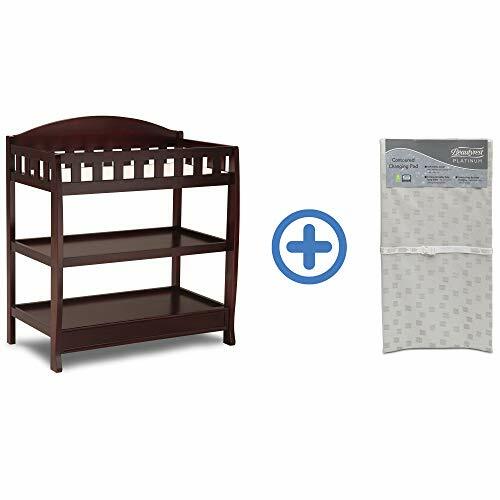 Toys and accessories shown with the table are not included except as mentioned above. 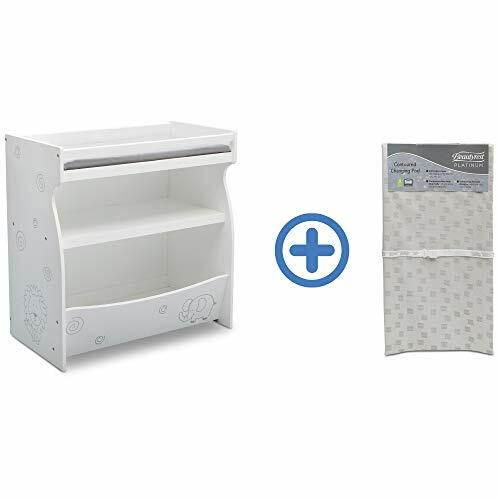 Changing table can be used with children weighing up to 30 lbs. (13.6 kg). This item ships in its original carton which may include a photo of the product. More detail on the hamper and basket: Helpful handles on the hamper for lifting and carrying. Hamper fabric a 65% polyester/35% cotton blend and can be spot cleaned. Basket fabric a 80% polyester/20% cotton blend and can be spot cleaned. 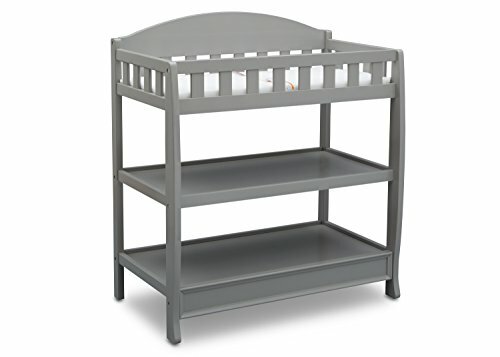 Keep diapers and supplies within reach with this Universal Hanging Organizer for Changing Tables from Delta Children. 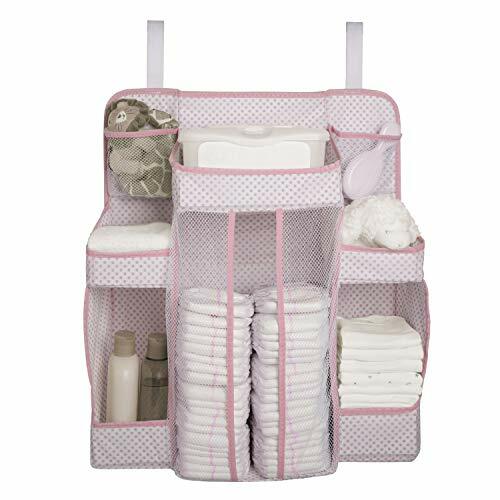 Equipped with a sturdy reinforced shelf on top to store baby wipes, a spacious diaper caddy that can hold up to 72 diapers, two mesh pockets for toys or pacifiers and four compartments for bottles, burp clothes or lotions, this hanging organizer will keep all of your baby's essentials within arms reach. 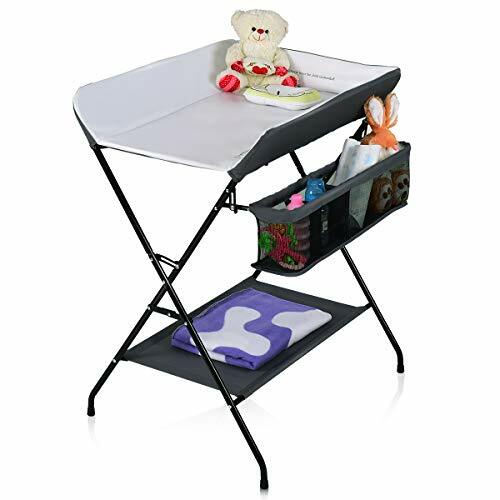 It easily attaches to the side of most changing tables with two adjustable straps (changing table sold separately). 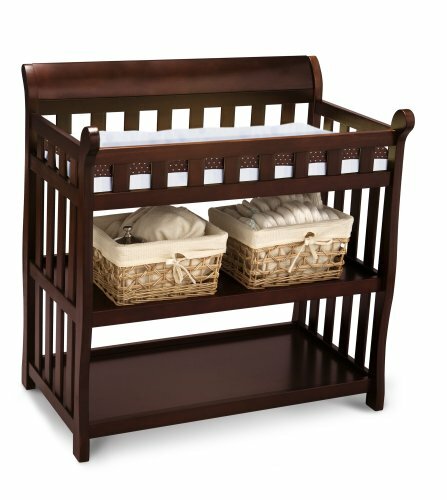 Delta Children was founded around the idea of making safe, high-quality children's furniture affordable for all families. 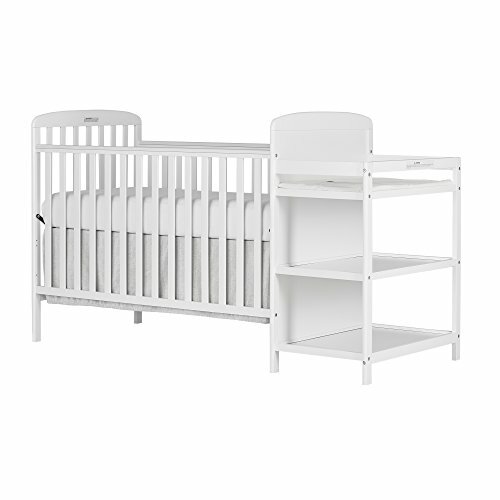 They know there's nothing more important than safety when it comes to your child's space. That's why all Delta Children products are built with long-lasting materials to ensure they stand up to years of jumping and playing. Plus, they are rigorously tested to meet or exceed all industry safety standards. 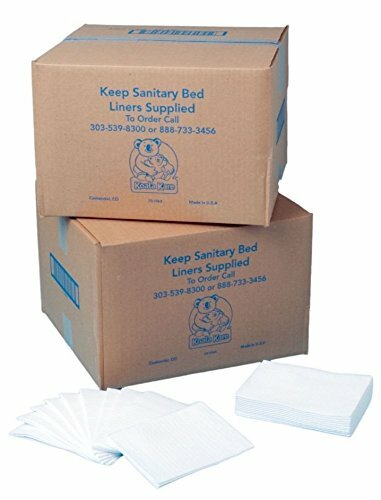 The ultimate diaper changing pads provides stress-free diaper changing for all parents - Say goodbye to towels, and hello to the superior way to change your baby's diaper.Very Durable And Resistant To The Fabric Itself. Washing And Maintenance: Wash Below 30 Degrees, Can Be Hand-washed And Machine-washed, It Is Not Recommended To Brush With A Brush. Gift that special person in your life with a convenient gift that can be used day after day! 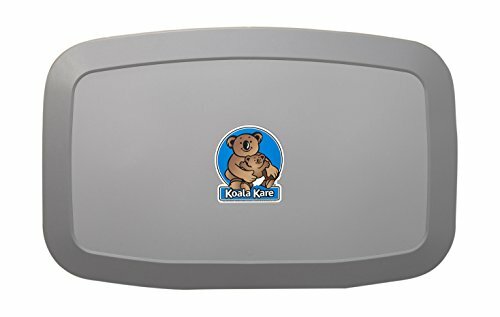 The diaper changing pad is easy to fold, easy to carry and store, small and light, and no smell. 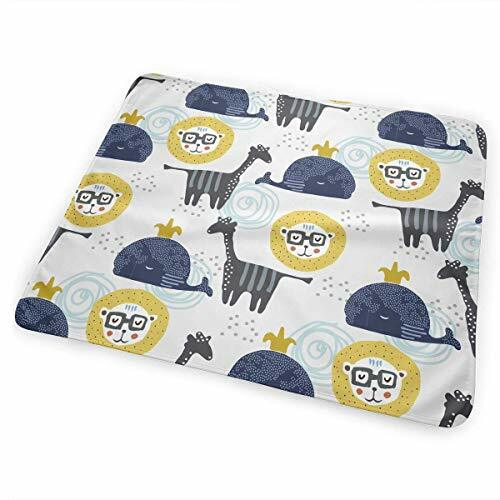 Waterproof Changing Pad Liners Provides Protection From Leakage And Is Incredibly Easy To Clean,With A Damp Cloth Or Wet Wipe! Can Be Reused Multiple Times. Diaper Change Covers Size (25.5x31.5).It mades of high quality polyester cotton. LARGE BEAUTIFULLY DESIGNED MAT - In a market saturated with bland design, we provides a patterned mat packed with aesthetic appeal and functionality. SATISFACTION GUARANTEED - If for any reason you're not satisfied, simply contact us to solve issue. Our money back guarantee means you can try our changing pad at zero risk!